Instruction For Use: Use as a condiment for noodles. Ingredients: Vegetable Oil, Chilli (25%), Fermented Soybean, Ginger, Soy Sauce, Sichuan Pepper, Sesame Paste, Flavour Enhancer (E621). 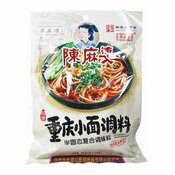 Simply enter your details below and we will send you an e-mail when “Chonqing Style Condiment For Noodles (陳麻婆重慶小麵調料)” is back in stock!